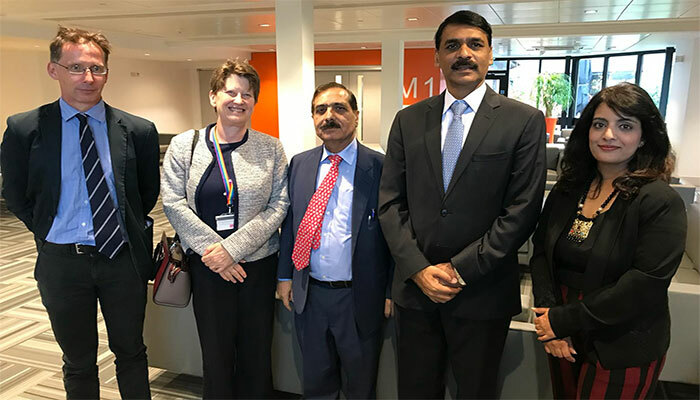 WARWICK/LONDON: The Director General of Public Relations (DGISPR) Major General Asif Ghafoor has said that Pakistan is indispensably and positively relevant to the world and the future global economy passes through this part of the region. The DGISPR delivered a comprehensive talk about Pakistan and its contributions to regional peace at the Warwick University on Tuesday to a mix of students including Pakistanis. The DG talked about regional geo-strategic environment, events leading to the war on terror and success story of Pakistan in war against terrorism and militancy. Professor Chrstine Ennew, Provost of the Warwick University, and several faculty members attended the talk. Renowned Pakistani educationist Syed Abidi was also present on the occasion. The DGISPR through presentation explained Pakistan’s importance to students and how Pakistan deals with various challenges and what are the actual issues confronting the country and the region. The DGISPR took questions from students on issue of security and the region and explained Pakistan’s point of view in detail. He said that Pakistan made available GLOCs for critical logistic support to the international forces operating inside Afghanistan without which they couldn’t have sustained. The DGISPR said that Pakistani intelligence apparatus provided key information to the international forces against Al-Qaeda which helped defeat the terror group. He said that defeat of Al-Qaeda could never have been possible without intelligence help provided by Pakistan. Talking about future of Afghanistan DG said that Pakistan has achieved relative stability in Pakistan; however, there cannot be enduring peace in Pakistan and the region if there is no peace in Afghanistan. The DGISPR said that Pakistan is positively relevant to the Geo-political and Geo-economic pursuits of the world powers in the region. “The future of the region and the globe is not without Pakistan, we have a potentially rich economy, we are bestowed with great resources, majority of today’s Pakistani of our population is youth,” he said. Major General Asif Ghafoor explained that there was a time not long ago when terrorists were only 60 miles away from the capital threatening to take over the capital and it was at that time when the conflict in the neighbourhood had overflown into Pakistan. He said the Army decided to take the threat of a new kind of terrorism head on and went on to sacrifice nearly 70 thousand people. “It has not been without human and financial cost. The sacrifice we have paid to restore Pakistan is huge,” he said while talking about the sacrifices Pakistan has made. “These are not just the pictures but our soldiers and civilian who have sacrificed their lives to make Pakistan peaceful,” said the DGIPR while showing pictures of few of the martyrs of Pakistan to students and researchers. The DGISPR explained the peculiarities of Western zone and said Pakistan is often misunderstood and blamed for the things that the country can never think of doing. He explained how the issues of refugees and terrorism has bogged down the country yet Pakistan has gone out of its way to help its Afghan brothers throughout by hosting them in their millions and now helping them in their rehabilitation. The DGISPR told that Kashmir is the mother of all disputes and Pakistan will never compromise on the rights of Kashmiri people and will continue to offer moral support. He said that war is never without a cost and this is paid both by the security forces as well as the local population. “Military operations alone cannot bring peace, it has to be followed up by development pronged strategies,” he said. He explained to students how a section of youth was radicalised by terrorists and used for their purposes but the Pakistan army has played a big role in deradicalisation and rehabilitated the affected youth. He said that Noble Peace Prize winner Malala Yousufzai was attacked in Swat by terrorists who were against the education of girls and youth and the same elements threatened to take over Pakistani society. He said that terrorists had declared war on Pakistan because they were against education and national cohesion. Answering question by a student, Major General Asif Ghafoor said that demands of the Pahstoon Tahaffuz Movement (PTM) are genuine and there are genuine issues in the FATA. He said that Pakistani government is doing lots of work in the FATA and areas of KP to carry out the development work with help from the local people. He said that Pakistani state was fully aware of the issues faced by the local people while devoting itself to development work. He said that demands of the PTM were genuine but the methodology was not right. The DGISPR told students that Pakistan – like no other country in the world – cannot afford to take anyone write challenge of the state by taking law into their hands. He said that it was resolve of the state to enforce its wrist at all costs.